Interesting reports emerged in Italy regarding the future of Palermo’s starlet, Javier Pastore, who have been filling the headline recently, as the player confirmed the intention to leave the Rossanero this summer. According to Sky Sport, Pastore reveals the departure idea in an interview with Radio Fox Sport, stating that this year might really be the perfect time to take his career furthermore and depart from Renzo Barbera. “I feel it’s time to leave Palermo. 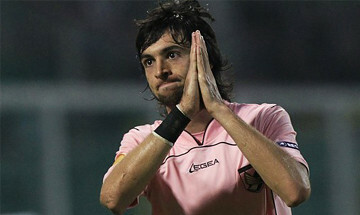 For a year president Zamparini says a lot of things about me, some are true, but others are not,” Pastore told Radio Fox. This statement pretty much strengthen the Palermo’s president’s previous words that he is ready to let Pastore go this summer, should there’s a good offer arrived at the club and if the player himself wants out. Despite his supposedly ‘controversial’ acts at times, Zamparini is being known as a president that won’t kept his start players against their own will as recently he already sold Edinson Cavani, when the player asked for a transfer last summer. Pastore’s recent statement will surely erupt the transfer market as the door has pretty much opens for the likes of Ac Milan, Inter Milan, Juventus, Napoli, Chelsea, Barcelona or even Malaga, to submit an official bid for the player. Although the Argentinian talent is being tagged around 50 million Euro, there’s a big possibility that he will go with a lesser amount, especially if the player himself have already revealed his intention towards the president. Moreover, Zamparini also stated earlier that should there’s a real serious interest on the player, he is hoping that Pastore’s transfer can be finalized as soon as possible, so the Rossanero will have enough time to look for a replacement. This condition will make the transfer market gets interesting in this early days, because Pastore himself will be involved in the Copa America, that will be held next month in Argentina, so if no official deal being made in the next few weeks, than the deal might be extended after the South American prestigious competition ended.